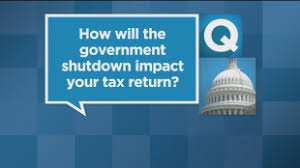 Government is Shut-down….Tax Due Dates Remain! Government has shut-down. However, tax due dates remain effective. Thus, employers and small businesses should continue to file their W-2’s and 1099’s by Jan. 31, 2018. Individuals should file tax returns and pay any tax owed by April 17, 2018. An extension can be filed which automatically extends the due date to file your tax return by six months. However, any tax owed is still due on April 17, 2018. If tax due is not paid, penalties and interest may be applied. Jan. 31 – W-2 and 1099 must be issued to employees/independent contractors & filed with appropriate government agency. Mar. 15 – Partnership (Form 1065) and S-Corporation (Form 1120-S) tax returns are due. Schedule K-1 is to be issued to each partner/shareholder. Apr. 17 – Individual (Form 1040) and Corporate (Form 1120) tax returns are due. Any tax owed from 2017 tax year is due to avoid penalties and interest. This entry was posted in Blog on January 22, 2018 by c06675329.